TRADITIONAL music has become a little more accessible in South Kildare thanks to the new Athy Comhaltas Group. For the first time in almost 50 years there is a local Comhaltas Group in Athy and the opportunity to learn Irish music has now never been easier. There was plenty of ceoil agus caint at the official launch of the group in Athy library on Saturday night and evidence of the huge appetite for the Irish culture was evident in the room. “Making music affordable, getting people interested in the Irish language and culture in South Kildare is very important,” said PRO for the group Cllr Thomas Redmond. Lessons are expected to kick off in Febraury and are expected to take part on a Tuesday night in the gaelscoil during the school term. At the launch organisers gathered information about what musical instruments people are keen to learn. Lessons are expected to cost €5 and start for ages 7 years and up. Launch of Athy branch of Comhaltas Ceoltoiri Eireann at Athy Library. “We are very conscious of the fact that we are dealing with children so the gaelscoil is the natural partner for something like comhaltas,” he added. Chairperson of the group is Kelly Lawlor. 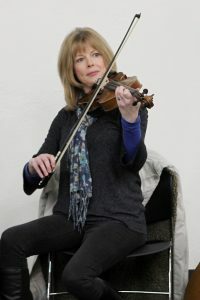 She is originally from the UK but living in Moone and has been a part of the Comhaltas movement throughout her life. “It just go to show Comhaltas reaches further afield,” he added. Cllr Redmond has recently started to learn how to play the uileann pipes. Membership per family is €20 and €12 for an individual.